Response: Antibiotic tolerance, together with drug resistance, makes bacteria refractory to antibiotics and can cause treatment failure in subacute and chronic bacterial infections. 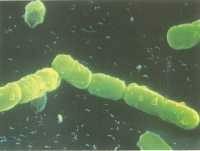 Pseudomonas aeruginosa, a major health concern worldwide, can cause severe chronic infections that are refractory to antibiotic treatments due to tolerance. Since the discovery of new antibiotics has been drastically diminished over the last decades, overcoming tolerance could be a strategy to enhance the efficacy of currently available antibiotic treatments. However, very little is known about the mechanism of tolerance, even though this phenomenon has been observed over 60 years ago. Response: We discovered a new mechanism to explain how Pseudomonas aeruginosa develops antibiotic tolerance. This system involves an intricate interplay between stress pathways known to allow bacteria to survive under adverse environmental conditions, namely starvation (stringent response) and oxidative stress (superoxide dismutase), leading to changes in the membrane permeability. We found that starvation-driven antibiotic tolerance is mediated by superoxide dismutase activity, a well-established oxidative stress defence. The superoxide dismutase activity triggers changes in the bacterial membrane, leading to reduction in permeability which prevents antibiotics from entering bacteria and thus exerting their toxic effects. We showed that by shutting down this system, we can make tolerant Pseudomonas aeruginosa bacteria become susceptible to antibiotics. When tolerant bacteria are exposed to antibiotics and don’t die, they also form a “breeding ground” for antibiotic resistant mutants to appear. We also found that inactivating superoxide dismutase activity could prevent the appearance of antibiotic resistant mutant bacteria. Response: Our results show how the function of the superoxide dismutase enzyme is important to antibiotic tolerance in Pseudomonas aeruginosa. This basic science discovery could guide the design of adjuvant therapies that bypass tolerance and thus potentiate antibiotic effectiveness in chronic infections. Response: Several questions remain to be answered in the basic and applied aspects of this study. The first is to determine what changes in the bacterial physiology are triggered by superoxide dismutase activity that culminate in the remodelling of the bacterial membrane. The second is to determine whether this tolerance mechanism is present in other clinically relevant species. The third is to look for molecules that can inhibit bacterial superoxide dismutase activity and/or increase membrane permeability, and explore them as adjuvant therapy to enhance currently available antibiotics. Superoxide dismutase activity confers (p)ppGpp-mediated antibiotic tolerance to stationary-phase Pseudomonas aeruginosa. Martins D1,2, McKay G2, Sampathkumar G1, Khakimova M1, English AM3, Nguyen D4,2,5. This entry was posted in Antibiotic Resistance, Author Interviews, Infections and tagged antibiotic resistance, antibiotics, medical research by Marie Benz MD FAAD. Bookmark the permalink. I am a student who is interested in antibiotic infections and wants to know more about the subject on a clinical level of understanding. What articles or books would be recommended to develop this knowledge?